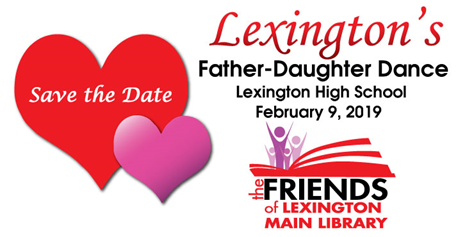 The Friends of Lexington Main Library to host the 13th annual Lexington Father/Daughter Valentine’s Dance to benefit the library. The Friends of Lexington Main Library announce the 13th annual Lexington Father/Daughter Valentine’s Dance on Saturday, February 9, 2019 from 6:30 pm until 9:30 pm in the cafeteria at Lexington High School, 2463 Augusta Highway, Lexington, SC 29072. The dance will provide fathers and grandfathers an opportunity to create a special memory for their daughters or granddaughters while supporting the reading center at the Lexington Main Library. The dance is for fathers and daughters of all ages. With a Valentine’s theme, the dance will include wholesome music, flowers and sweet treats. There will be catered with appetizers and desserts. Each daughter will receive a pink flower at the end of the evening to remember the special night. Sunday dress is recommended. All proceeds of the evening will benefit the Youth Services Department of the Lexington Main Library, which serves children and teens age birth to 18. Tickets are $40 per couple with $10 for each additional daughter ticket. Tickets are available for purchase at www.lmlfriends.org. Ticket service provided by Eventbrite. Paper tickets are not available for 2019. Tuesday, February 5, 2019 is the deadline for buying Tickets for $40. Beginning February 6, 2019, couples tickets are $55 and each additional daughter ticket is $10. This only applies if there are tickets remaining. The dance has sold out the last 3 years. For sponsorship opportunities please contact Marlena White at (803) 920-2437. © 2010 Friends of the Lexington Library. All rights reserved.